Oribi helps companies and marketing agencies increase conversions - more leads and higher sales. Analyze and optimize your call to actions and top pages - Easily know which buttons your visitors click the most, on which pages they perform best and where you lose visitors on their way to convert. See the big picture - Instead of endless data. While Oribi tracks all the interactions on your site, you’ll get the summary of the meaningful events, insights and trends. Track your main marketing channels - Know how visitors coming from Facebook, Google, Adwords, Instagram and more behave, discover usage patterns by channels and reveal which channels convert best. Cross domains support - Build cross-domain funnels and track your visitor behavior across all your domains. No coding needed - Oribi was designed to give you easy access to your web analytics. Define your main conversions, build funnels and create reports with zero code. 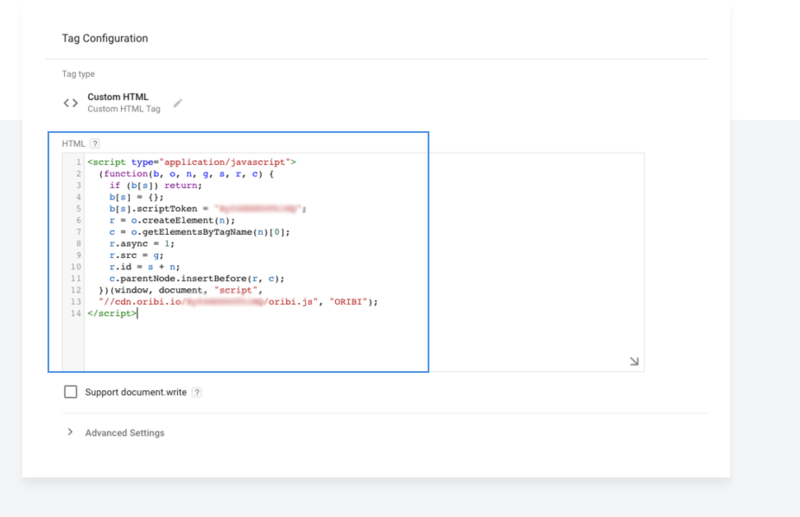 The first step for using Oribi is to add a unique tracking code to your site, which is similar to adding a Google Analytics tracking code or a Facebook pixel. This is the only time you'll be asked to use a code. You won't need to update the tracking code in the future. Oribi's tracking code does not affect your site or its performance in any way, including your site's loading time. Copy the code. 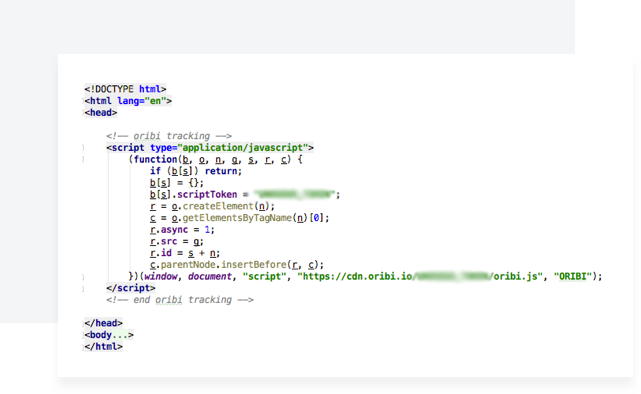 Once you're signed up with Oribi, you'll receive your unique tracking code. You can use the same tracking code for multiple domains. During the free trial you can connect up to 5 domains. After adding the tracking code, simply visit your website to activate the tracking code. We've prepared step-by-step guides to help you add your Oribi tracking code to your site. Paste the code above the </head> tag in any HTML page(s) you wish to track. Go to the Google Tag Manager. 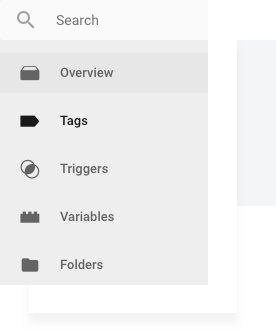 In the menu on the left, click Tags. Click on the Tag configuration box. In the Choose tag type list select Custom HTML. Paste Oribi's tracking code in the HTML box that appears below. Under Choose a trigger, select All Pages to enable Oribi to track your entire site. In the upper left corner, give a meaningful name to this new tag, such as ″Oribi″. In the upper right corner of the overview click Submit. Give the new version a descriptive name and click Publish. If you haven't installed one already, there are plenty of free WordPress plugins available that will allow you to easily insert external code. Header and footer scripts is a good example of this type of plugin. 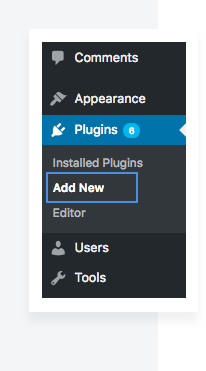 In your WordPress admin console, click Add new. 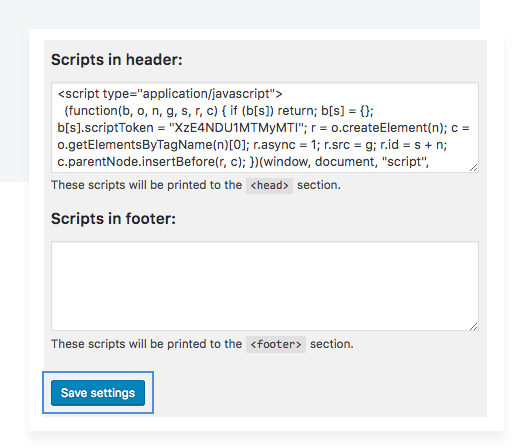 In the search plugins box, search for ″Header and footer scripts″. Click Install Now on the Header and footer scripts plugin. Once the button text has changed to Activate, click it again to activate the plugin. After the plugin is added, add Oribi's tracking code to all pages by going to Settings -> Header and footer scripts. Paste Oribi's tracking code in the Scripts in Header box. 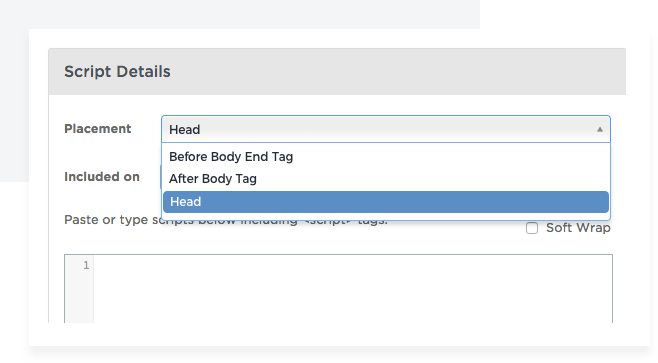 Once the dialog box opens, paste your Oribi tracking code in the Head section, right before the </head>. Go to Online Store -> Themes. 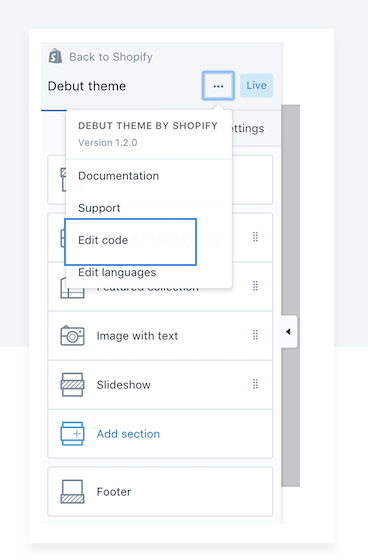 Click on the … button next to the theme name, then click Edit code. Under Layout, click on theme.liquid. Paste Oribi's tracking code just above the closing head element (</head>). On the sidebar, choose Settings. Click on the New Tool button and select the Custom option. Paste Oribi's tracking code in the text box, name it ″Oribi″ and make sure All pages and Head options are selected. 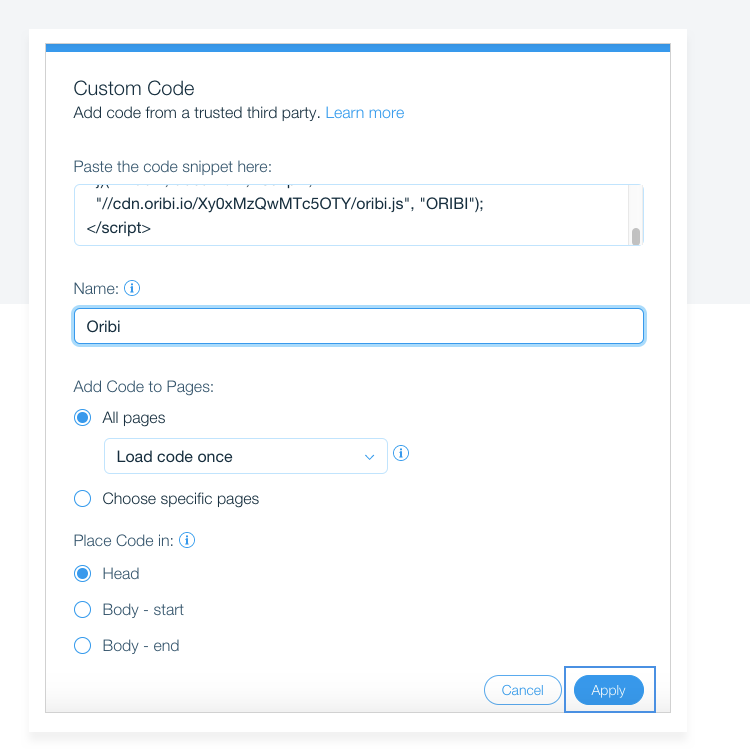 You can insert the code to your squarespace page using Code Block. Open a page or post editor, click Insert Point or + and select Code from the menu. Make sure that HTML is selected in the drop-down menu. 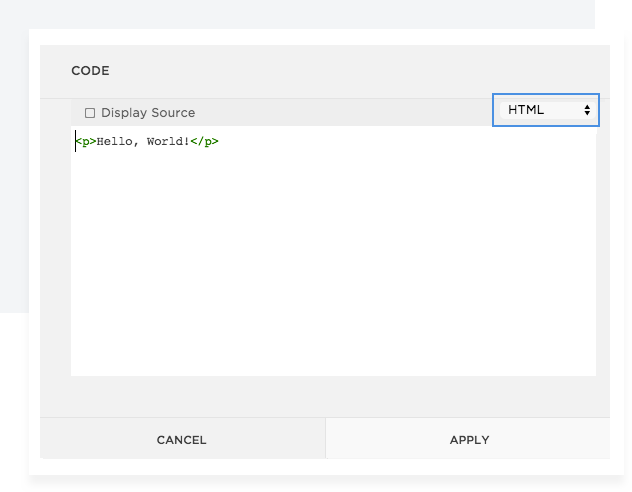 Replace the <p>Hello, World!<p> with your Oribi tracking code. Now, click Apply to publish your changes. Copy your Oribi tracking code in the Head field and close the window again. TL;DR - Oribi's tracking code will not affect your site's performance or loading time. Performance/Loading time – Your Oribi tracking code was designed to not impact the performance of any page you embed it on. We achieve this by loading our script asynchronously (i.e. our script only starts when your site finishes loading). Script size – The script is minimal in size — 29kb to be precise. This is probably smaller than any image on your website. Browser support – Your tracking code runs perfectly on pretty much any browser out there: both iOS and Android device browsers, Opera, Chrome, Firefox and Internet Explorer (as far back as IE7). 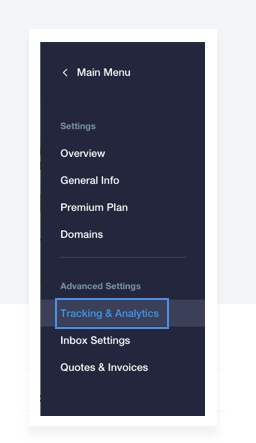 Immediately after adding the tracking code to your site, Oribi starts collecting every button click, form submission and page visit - i.e. events. Our algorithm detects and analyzes patterns in your visitors' behavior and builds your insights to help you increase your conversions. This will take 24 hours. Don't worry, you'll get notified per email, once your account unlocks. Please note, that events are collected the moment they are performed by a visitor for the first time. 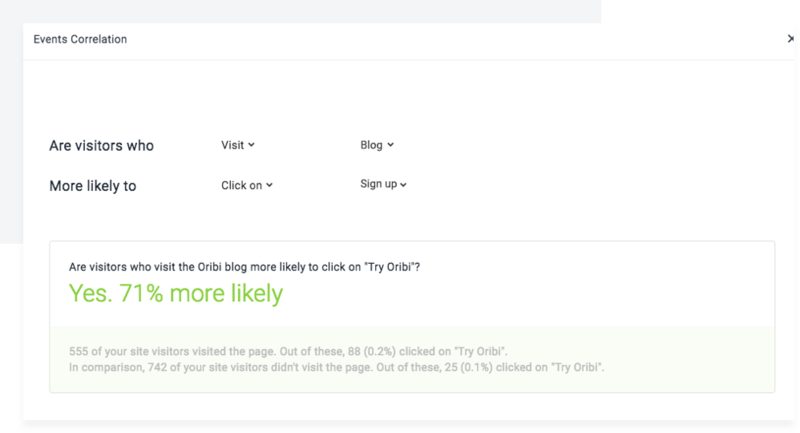 If you don't find a button or page in your Oribi account, most likely it has not been clicked or visited yet. Just open your site, perform the event you want to track and refresh Oribi. Oribi automatically tracks all button clicks, form submissions and page visits on your site. You can easily track your main conversions and visitors’ activity without using code. 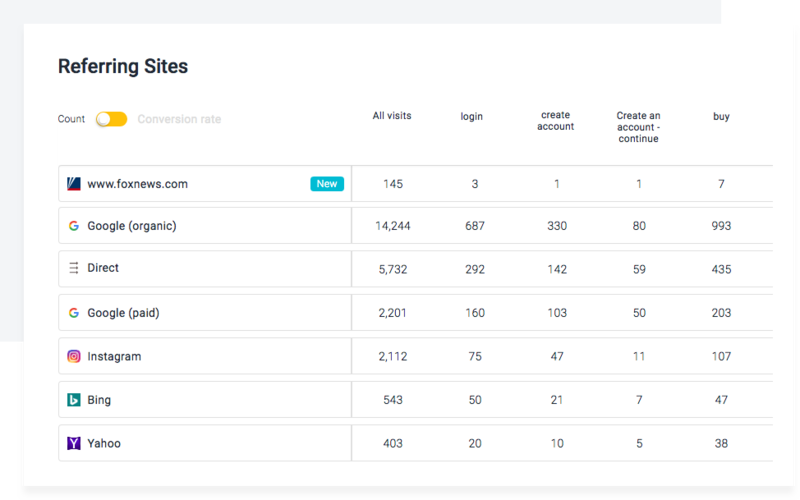 Unlike other analytics tools, Oribi tracks every single interaction and covers 100% of your visitors’ activities - button clicks, form submissions and page visits. Pinned Events represent your ‘favorites’ or ‘bookmarks’ - top conversions and events you want to keep in sight, such as sign ups, payments or downloads. 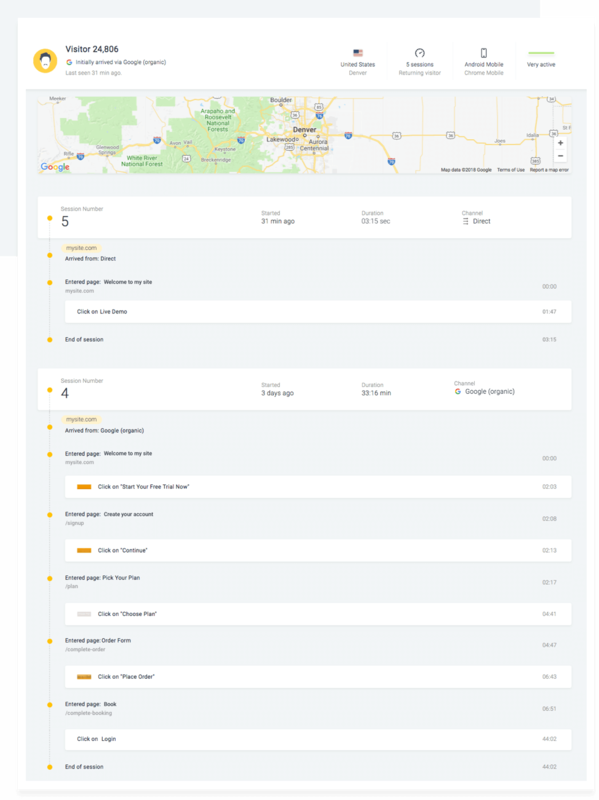 Pin events to include them in your dashboard, reports and insights. A Pinned Event can be a single event or a group of events, for example, all buttons which lead to the sign up page or all your blog posts. You can pin an event anytime. Once pinned, it will include all of its historical data as well. Select Pin an Event from the top bar. To find a specific event, simply search it by name or by the page it appears on. Events which appear on a menu, footer or pop up will be labeled to help you recognize it easily. The event didn't occur in the last 30 days. Go to your site and click the button or visit the page you want to pin. Refresh Oribi and search it again. In many cases, grouping buttons or pages will help you track your visitors’ activity better. Group all post pages to track visits to the blog. Group all buttons - ″Sign Up″, ″Sign Up Now″, ″Get Your Account″ - linking to your sign up page to track all sign ups independent of the button label. Pin a new event or edit an exisiting event you want to group. By Link: Usually the most effective way to group events. Define a link, such as ″/signup″, to group all buttons on your site that link to the defined destination. This can be a page in your site as well as an external page, e.g. all buttons linking to youtube.com. Choose Containing phrase to define a page group, such as all pages containing ″blog″. By Label: Group buttons according to their label, such as ″Join now″, ″Join today″ and ″Create account″. Note: No need to change your Pinned Event, if you add a new button to your site. 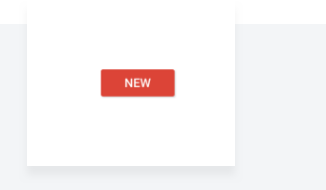 Oribi will detect new buttons meeting the same rules and automatically add it to your Pinned Event. Pinpoint buttons by the pages they appear on. This way, you can track button clicks only from specific pages, such as clicks on ″Create Account″ from the home page. Choose the pages you want to include by defining the Exact page or by choosing pages which contain a selected phrase. For editing or unpinning events, enter the Manage Pinned Events section. Hover over the light bulb icon to see how a Pinned Event was defined and if it groups events. Click Edit to make changes to any Pinned Event. Click Unpin to remove a Pinned Event from your account. Unpinning an event won't remove or modify the original events, and you can always pin it again. 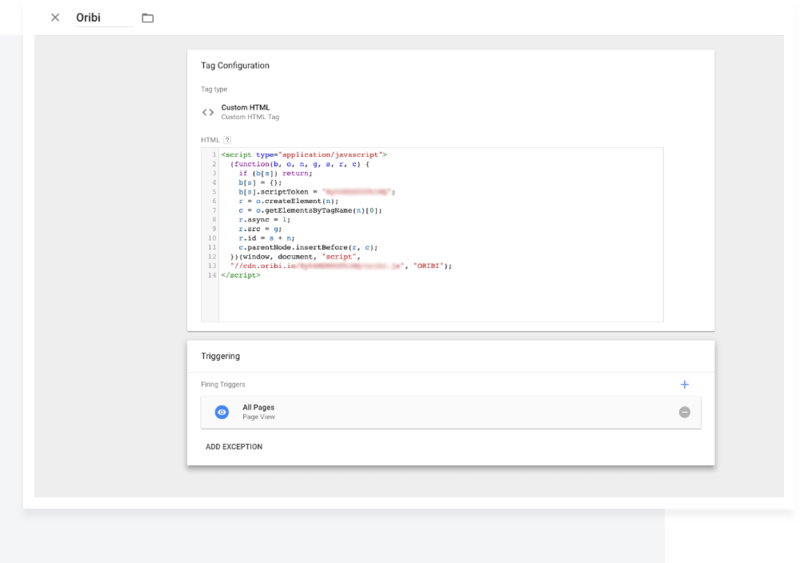 Events that occur in an iFrame - an embedded element which isn’t tracked by Oribi’s script, such as a payment form, chat component or a YouTube video. Events coming from a different site, such as a checkout process which ends on an external site. Form submissions with no thank you page. While Oribi tracks all clicks on the submitting button, you can use custom events to track successful form completion. Importing a Custom Event will not overwrite or modify the original event in any way. Oribi adds an identical call which will be sent to your account without affecting the original event. If you change the original event, it will automatically be updated in Oribi as well. Note: In case the original event is deleted from your site, it will no longer appear on your Oribi account either. Invite team members, share stats with clients, manage your domains or exclude specific IP addresses. To give access to your team members, go to Settings > Invite Team Members. The invitation is per domain. If you have more than one domain connected, invite team members while you’re in the domain you want to grant access to. During the free trial you can invite up to 5 team members. 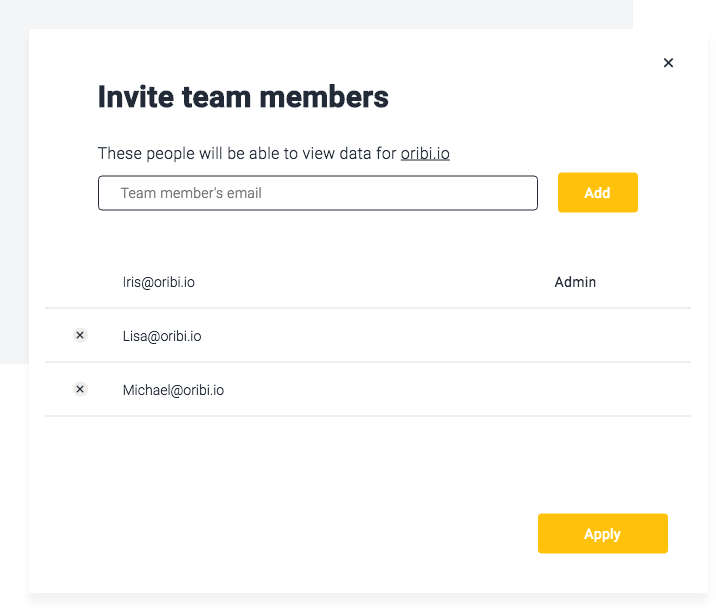 Invited team members have full permission and can create Pinned Events, Funnels, Event Correlations, and more. At any stage, you can block an invited team member from any or all of your domains. If you want to remove a guest from the domain, simply click the X next to this member's email address. With Oribi, you can track multiple domains with one account. To add a new domain simply add your tracking code to it. 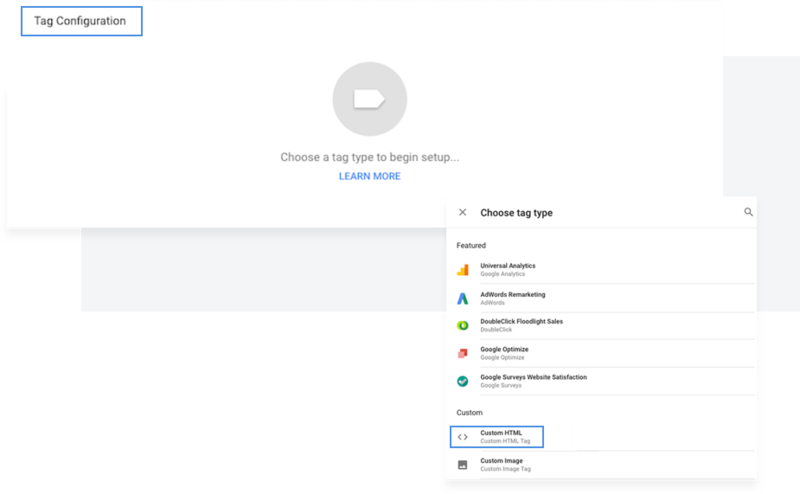 You can retrieve your personal tracking code and find the link to the installation instructions via Settings > Add a Domain. This can be a domain (oribi.io) or a subdomain (blog.oribi.io). During the free trial you can add up to 5 different domains. To switch between different domains, use the drop-down menu at the top of the screen. Note: Are you not sure whether the script is still connected? Go to Settings > Add a Domain to see if the connection is working. If you see an error message, make sure the script is still on your site. Oribi supports excluding specific IP addresses or an IP range. This means Oribi won't track any action coming from the IP's you've excluded. You might want to exclude addresses like your company IP's to ignore internal tests and sessions within your company for your insights and trends. Once you’ve excluded IP addresses, data coming from these addresses will no longer be sent to Oribi servers. It will have no impact on the data collected before the exclusion. To exclude IP addresses, go to Settings > Account Settings and scroll down to Exclude IP Addresses. Enter the IP address or the range of IP addresses and click Exclude. Single Pages to dive deep into your Pricing page, landing pages, etc. Group of Pages to track your blog, etc. Discover usage patterns to learn which types of visitors and what journeys lead to high conversion rates. Learn where you lose visitors and optimize each step to increase conversions. Count - is the unique count of visitors who clicked this button. Conversion rate - is the % of visitors who clicked this button out of the total number of visitors who saw the button. Oribi identifies all the visitors to the pages including this button and tracks how many of them clicked the button. The conversion rate helps you understand how many visitors convert out of the potential reach. All Visits provides the big picture of your visitors’ actions. See breakdowns by channels, platform, country, pages visited and UTMs. Each breakdown displays the number of unique visits as well as the number of conversions for each of your Pinned Events. Use this section to easily see how different parameters, such as channel or platform, affect your conversion rate and what each visitor segment does on your site. Pinned Events represent your main conversion goals, such as sign ups, purchases, or blog visits. These can either be button clicks or page visits. To explore what affects your Pinned Events, choose them from the side bar under Explore Button Clicks or Explore Page Visits. If you want to explore a button click, form submission or page visit you haven't pinned, simply select Explore Button Clicks > Explore More Buttons or Explore Page Visits > Explore More Pages and use the drop down to find the event you're looking for. Use this section to understand your conversions better and identify optimization opportunities. The timeline visualization helps you track conversions and identify usage patterns. Tip: Note the dots on the timeline. Each dot represents a potential cause of changes in your conversions helping you explain an increase or decrease. Dots can represent holidays (in any one of the main countries your visitors come from), traffic peaks from a certain channel, a new page added to your site (such as a new blog post) or weekends. Hover over the dot to see more details. Find out how many people coming from each channel clicked the selected button. The channel represents the First Touch, meaning the first referrer the visitor has visited your site from. For example, if a certain visitor clicked on your ad on Facebook, and a few days later returned via Google to sign up, the channel displayed will be Facebook. Oribi uses the First Touch Attribution model, because the first touch is usually the most meaningful one. The conversion rate reflects the percentage of visitors who convert out of the total number of visitors from this channel who saw this button. It helps you understand which channels can be optimized and which ones bring the most relevant audience for your site. Tip: The most important figure in the channels breakdown is the conversion rate. Google organic and direct traffic usually have the highest conversion rates. In general, these visitors actively look for your site or service and therefore are more likely to convert. For all other channels, low conversion rates typically means you bring the wrong audience or your message is wrong. For example. you could have a lot of traffic coming from Instagram, but hardly anyone who converts. Most likely, you need to change your marketing strategy there and post content which is closer to your service. See which platform visitors used to convert. There are two important metrics to track. The first one is understanding the trend - which platform is the most significant one? Are other platforms important as well or only drive a very small portion of visitors? The second metric is the conversion rate - it helps you understand how likely visitors are to convert based on the platform they’re using. In many cases, a major difference between the platforms is an important indication that the site or flow is not optimized for this platform. Tip: The conversion rate from mobile is usually lower than desktop. However, if it’s lower than 20-30% you can probably optimize it. In many cases, adjusting the design for mobile as well as simplifying the key pages can help close the conversion rate gap. 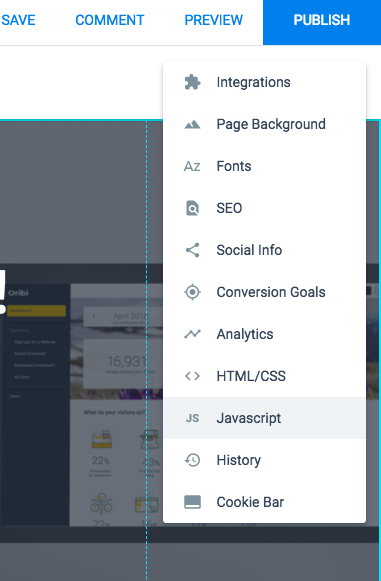 The By Page breakdown helps you analyze how each of your key pages performs. Find the pages people click on your button the most, and see the conversion rate of each page to reveal how many visitors to this page clicked the button. The By Page breakdown is also very powerful when optimizing your blog - easily see which posts convert best. Tip: Exploring key actions which appear on a menu or pop-up. The pages with the highest conversion rates indicate where the most valuable opportunities exist. You might want to add more calls to action on these pages. Track conversions by country. Use the conversion rate to learn how likely visitors from different countries are to click this button. A low conversion rate might indicate a language barrier or ineffective marketing channels for this location. Coming soon: Breakdown by state (US only) and city. The By Session breakdown helps you optimize your marketing efforts and budgets. It indicates how many times a visitor came to your site before converting. A common marketing practice is to get visitors to visit your site multiple times from different sources - retargeting, email campaigns, SEO, publishing content. This section helps you understand whether this is critical for your site. See which percentage of your visitors convert on the first visit, which percentage on the second visit, the third visit, etc. Tip: Use the Visitor Journeys to follow individual visitors through your site. Explore their sessions and actions before converting to learn what is important to optimize your results. If you’re working with UTMs, use this section to see conversions and conversion rates for each of your campaigns. Optimizing your top pages can be the key to increasing conversions. Use Explore Page Visits to learn which sections on your site are more significant and understand how visitors behave on each page. The Page Visits section includes the same breakdowns as the Button Clicks section as well as a breakdown of the button clicks on this page. You can also explore page groups, such as all pages of your blog, using the Pinned Events capabilities. A common practice today for analyzing pages is using heatmaps. Heatmaps provide very high-level data on how people are using your site. Oribi collects the exact number of clicks for each button. Without defining any code events you can see what are the most popular buttons on this page and what percentage of visitors click each one. This breakdown will help you understand what your visitors are looking for. Tip: Find the most clicked buttons on your key pages and highlight them on your site. These are the actions your visitors are looking for. Buttons with a low number of clicks you might want to place on another page. Use the Insights & Health Check section to get a quick, in-depth overview of the trends and highlights on your site, you should focus on. No need to go over all the stats yourself to spot changes. The Health Check alerts you about any trend on your site that you should act on. 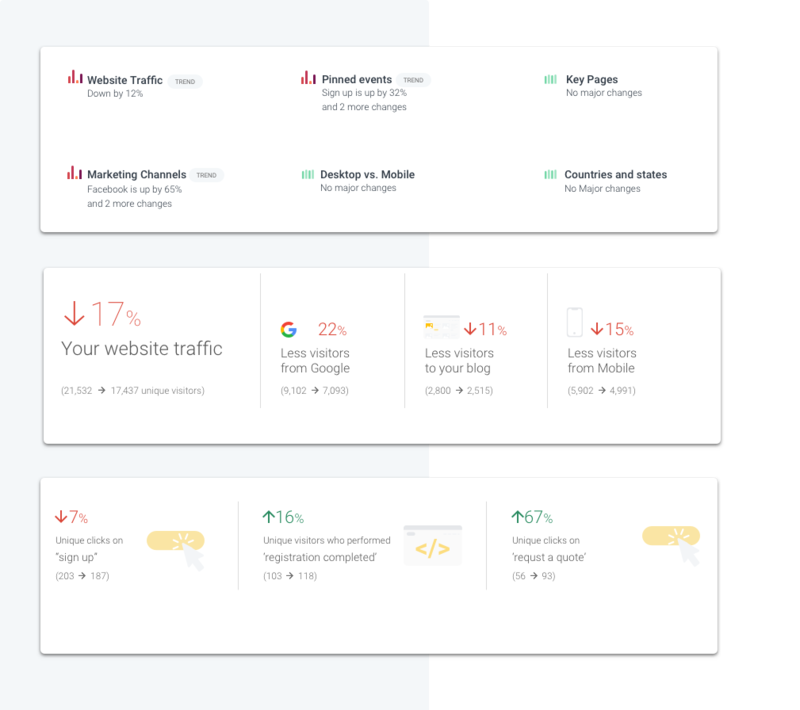 Oribi constantly monitors all your key parameters, such as your traffic, marketing channels, conversions, and visitors demographics. It compares the time period you’ve selected (last 7 days by default) with a similar time period to detect trends. To dive deeper into each trend and understand potential causes, select See All. Traffic. Where do changes in your traffic come from? 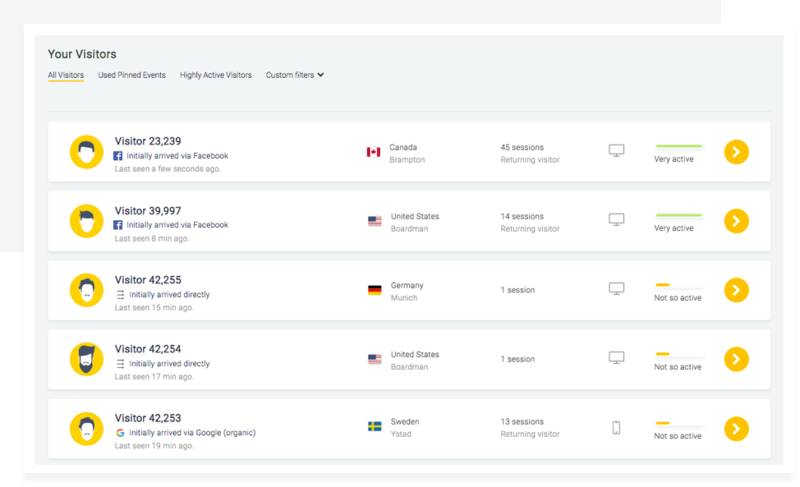 To help you understand trends better, Oribi scans the traffic from your marketing channels, the platforms your visitors use and the countries they arrive from, and highlights changes you should know of. Pinned Events. Understand changes in your main conversion goals. Oribi analyzes all your website data and reports potential causes for changes in your Pinned Events. Key Pages. Spot the pages that received more or fewer visitors for the period selected. This will help you understand how your key pages perform and detect trending pages. Channels. Follow your marketing channels and see how they develop across different periods. Find top performing channels to focus your efforts on. Desktop vs. Mobile. See how your traffic divides across all platforms for specific periods. Major changes in platform usage can help you explain certain visitor behavior and make sure you’re optimizing for the right platforms. Countries. Reveal the main countries that visit your site and detect trends in the top countries you drive traffic from to track the results of your acquisition efforts and help you target the right audience. Note: Traffic, Pinned Events, Key Pages and Channels display by how much percent your stats grew or declined. Desktop vs. Mobile and Countries report the percentage of your overall visitors to your site for the time periods chosen. Get the most relevant data in a glance. The Insights section will help you to understand the actions that have the biggest impact on your conversions. Top Marketing Channels. Understand how each channel affects your conversion rate. Choose "Compare more channels" to see all marketing channels converting visitors came from, as well as further breakdowns for this event. New Referrer. Know when a new channel refers to your site. Click on "See how it performs" to follow the actions visitors from this channel performed. Top Visitors. Discover your most active visitors. Select each of the visitors to follow all sessions and every step of this visitor on your site. Conversion By Session. Find out how many times your prospects need to return to your site before they convert. Click on "Explore event" to see the full breakdown for this event, such as the channels and countries converting visitors came from, the platform they’ve used, and the page they performed the action. New Page. Get a quick access to new pages and follow how many % of your visitors visit them. When clicking "Explore page visits", you’ll dive deeper into all the metrics for this page, such as the most popular buttons on the page as well as the platform visitors browse from. New Button. Check how new buttons perform and on which pages they perform best. Choose "Explore button clicks" to see the full breakdown for this event, how clicks develop over time, conversion rates for each channel, and more. Page Insight. See visitors’ behavior on your key pages and track what they click on. Select "Explore page" to get the full breakdown for this page, from peaks in traffic to this page, to the most popular buttons clicked. Note: You’ll receive the latest Health Check and your top Insights per email, every Monday. Watch out for Oribi in your inbox! See the conversions for every Pinned Event by each of your marketing channels at a glance. Switch from Count to Conversion rate to see the percentage of visitors who clicked any button you've pinned out of all the visitors who saw this button. Referrers which were detected for the first time will appear on top of the list and are labeled ″New″. This indication helps you to track new referrers and sites which recently wrote about you. Marketing attribution reveals the full journey of your customers and helps you understand which channels and campaigns were involved in a conversion. In today’s digital world, customers can interact with your brand on multiple channels before converting on your site. Let’s say, a prospect initially arrives at your site through a post on your company blog. A week later, he gets retargeted by your ad on Facebook and returns to your site. He signs up for a demo and leaves again. After the demo, a few days later, he creates his account on your site. Which of your marketing efforts drove the conversion? With so many channels and types of prospects, it becomes notoriously difficult to know exactly where or how to focus your efforts. Marketing attribution is the process of assigning the credit of a conversion - such as subscribing to your newsletter, downloading content or visiting the Pricing page - to the marketing channels involved prior to the conversion. Using this feature, you can identify all marketing channels for any button click, form submission or page visit, and choose how to assign ‘credit’ to each channel in any given campaign to evaluate your marketing efforts. Start, by choosing the conversion goal you want to credit your marketing channels for. A single-touch conversion is reported, when a prospect converted directly on their first visit to your site. For example, a visitor initially arrived at your site through a Facebook ad and converts in the same session. This section helps you find the channels that are strong enough to result in a conversion on the first visit. In most cases, your prospect needs more than one interaction with your brand before converting. Going back to our example, the customer had three touchpoints before creating an account: your company blog, the Facebook ad and finally returning directly after the demo. The first-touch channel, here the blog, is the initial touchpoint that leads a prospect to your site for the first time. Like planting a seed, it’s the first essential step for the conversion. The Facebook ad is the assist channel. This is the stage of nurturting your leads and building a relationship, similar to watering your plant to help it grow. The last-touch channel, in the example Direct, when your prospect returns after the demo to create an account, is the final touchpoint before the conversion. This is when you’re picking your fruit, in the end of the cycle. With this section, you will understand how many conversions occurred due to working on multiple channels and easily identify which touchpoints work best to for every step of the customer journey - from initally targeting your prospects, to nurturing your leads and finally reaching out to convert them to customers. Marketing-attribution models determine how credit for conversions should be given to different touchpoints in the customers’ journeys. The first-touch is the initial channel your visitor arrived to your site for the first time. Assist channels are the ones that nurture the relationship with your prospect. 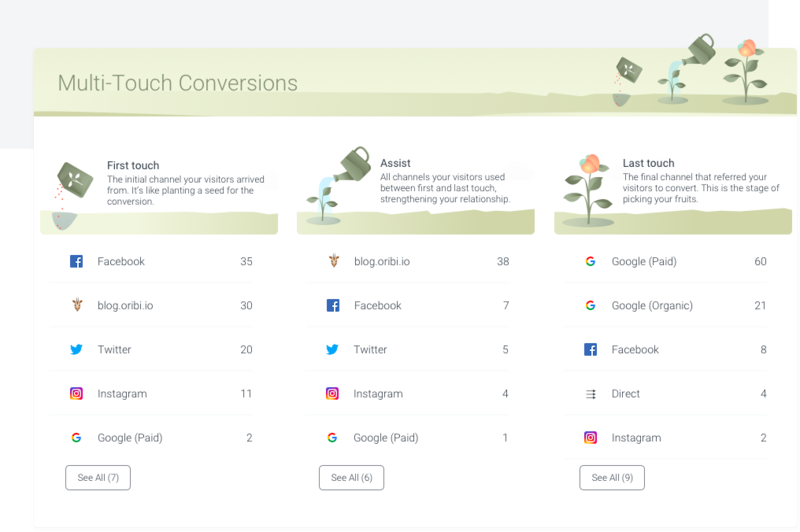 And the last-touch channel is the final channel that brings your prospect back to your site to convert. If you give more credit to the first or last stages of the customer journey, or divide credit equally across all channels, depends on the model you choose. Each model has its advantages. Which model is best, depends on the question you’d like to answer. The last-touch attribution model is the exact opposite of the first-touch attribution model. It assigns 100% of the credit to the last touchpoint a prospect had before converting on your site. This is the stage of picking your fruits. Your prospect already knows you and is ready to convert. This is a great model if you want to measure the touchpoint that is driving conversions, like conversion-driven campaigns or landing pages. The last non-direct click attribution model gives 100% of the credit to the last channel before a visitor converts, without taking direct traffic into account. Direct is reported when no channel can be determined. It can represent visitors who typed your site URL manually, arrived through an email link, a bookmark, a Mobile app, a PDF, etc. In many cases, visitors initially visit your site through a certain channel and later return after typing the URL or saving it somewhere. You may want to filter Direct traffic out sometimes, to credit your conversion only to known sources and evaluate your marketing efforts more easily. The linear-attribution model divides credit evenly across every touchpoint of the customer journey. This model helps you quickly understand the best of your customers’ journeys as a whole and optimize the entire picture, rather than just focusing on one touchpoint. The time-decay attribution model gives the credit to touchpoints closest in time to the conversion. This way, the further a touchpoint is away from the conversion, the less credit it will get. With this model, you will better understand which channels or touchpoints are pushing customers closer to the conversion. The position-based attribution model gives 40% of the credit to the first and last touchpoints and evenly distributes the remaining 20% among the assisting touchpoints in between. This model lets you optimize both, the touchpoint that led a prospect to your site as well as the one that actually ended up converting the prospect. It’s an easy way to evaluate all touchpoints for short-term campaigns with a few assisting touchpoints in between. The first-touch focus gives 60% of the credit to the first touchpoint, 20% to the assisting touchpoints and 20% to the last touchpoint. It focuses on the initial interest in your brand while acknowledging the other touchpoints that played a role in the conversion. The last-touch focus gives 60% of the credit to the last touchpoint, 20% to the first touch and 20% to the assist. Use this model to evaluate conversion-focused campaigns, while taking other touchpoints within this conversion into account. 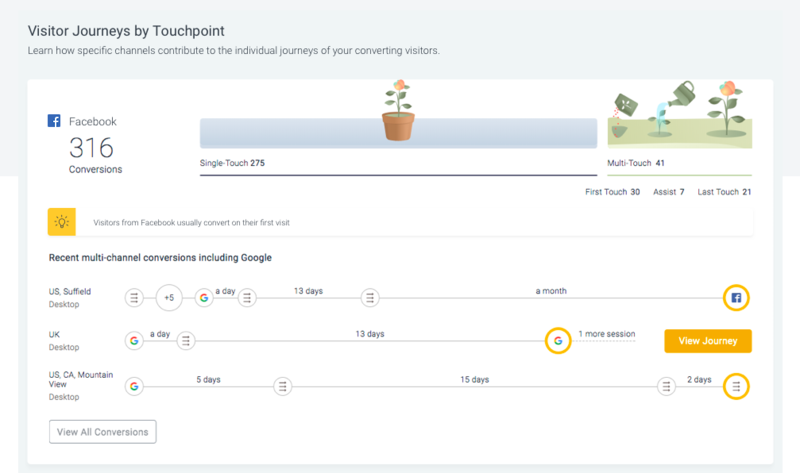 While the sections before identify all channels involved in your conversion, the Visitor Journeys by Touchpoint section helps you evaluate how a specific channel contribute to single visitor journeys on their way to convert. 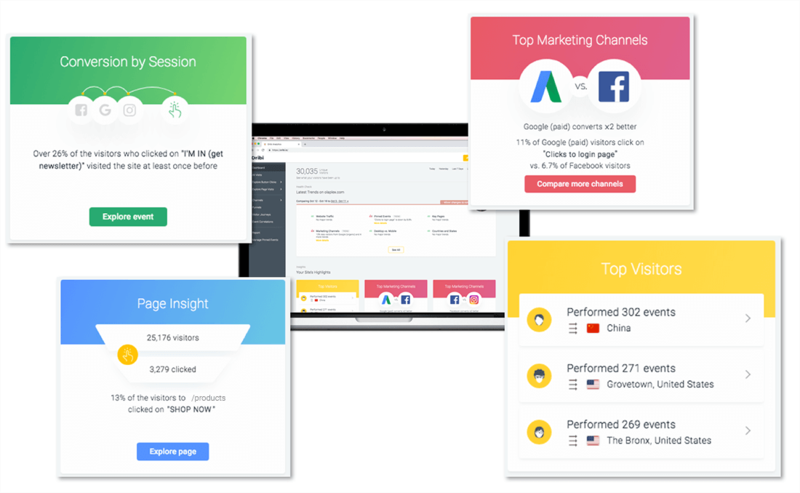 For every channel, Oribi evaluates if it performs better for single- or multi-touch conversions. For multi-touch channels, you also learn if the channel you’re looking at works best as first-touch, assist or last-touch channel. Each journey will display where the selected channel was used, the times in between each touchpoint, and the last-touch channel that brought the prospect back to your site to convert. Hover over specific journeys and click View Journey to see each step and every session this visitor took on the way to convert. Stay on top of bugs, browser issues, etc. A funnel is the path a prospect takes through your site which ultimately results in a conversion. Funnels are the best way to evaluate the success of your most important conversion flows, like signups, newsletter subscriptions, account creations, purchases, or anything that matters most to you on your site. Using Funnels, you can pinpoint exactly where in the process your prospects are dropping off and why, and then fix these "leaks" accordingly, so more and more of your visitors become customers. 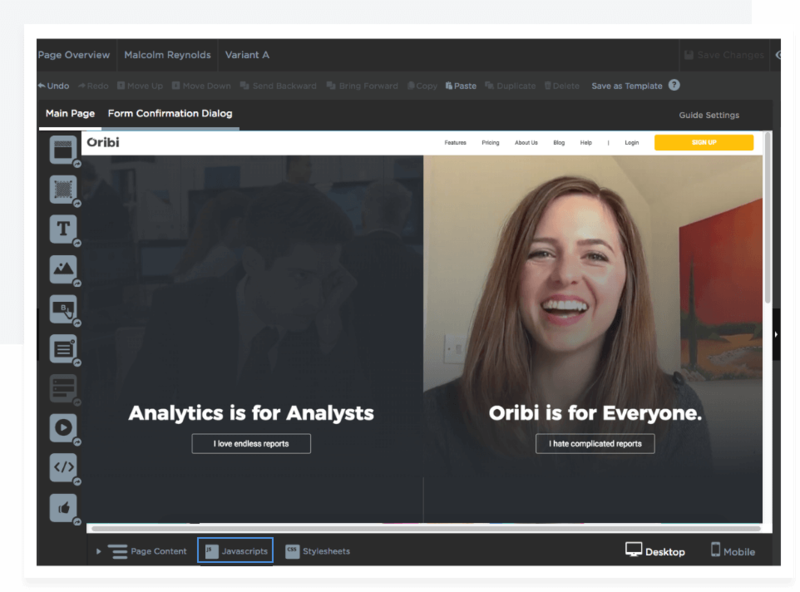 With Oribi, you can build funnels super easily. Every step in your funnel can be any Pinned Event, button click, page visit, form submission or custom event. Go to Funnels > Create a New Funnel. Define all steps - select the event types, choose the events you’d like to track from the drop down and name the steps. Now, give your funnel a name and click Save to complete. Segment your visitors to identify different behavior and get more meaningful insights. You can filter your funnels by channel, platform or country to see how many visitors from Facebook complete the funnel, compared to visitors from Google, and if mobile users have more difficulties in specific steps. 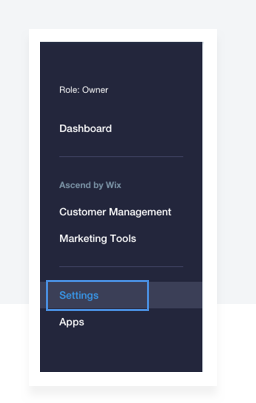 Simply select the filters, when creating or editing your funnel, and choose if you want to include or exclude certain channels, platforms or countries. Use Cross Domain Funnels to follow your visitors across different domains. This is a powerful feature to optimize your conversions. If you have multiple domains referring to each other, add Oribi’s tracking code to each of them. When building a funnel, toggle the Multiple domains switch. Now, you can pick domains for each step. Note that in order to provide an accurate count, each step is based on visitors who performed the previous step. If you add a step from another domain to your funnel, the count will represent only the visitors who have performed the action on the initial domain. Most tools report the total count for each step of the funnel. Oribi's Funnels, on the other hand, analyze each step and display the precise flow of visitors who progressed from one action to another. For example, out of the total number of visitors who accessed your landing page, how many signed up for your free trial afterwards. This way, you get the most accurate insights to analyze drop-offs and optimize your conversions. Note that the step count can differ from the total count of this event. Follow individual visitors through your site. Track each one of their actions across different sessions. See how your top converting visitors are navigating through your site and discover patterns. To get there, click Visitor Journeys on the sidebar. This section is an index of your visitors; use it to look up interesting journeys as well as specific patterns. The default sorting is by Last Seen - the visitors on top of the list are those who are currently on your site or the most recent visitors. Buttons Clicked - Follow visitors who clicked a specific button, such as completing checkout or downloading your eBook. You can choose any Pinned Event or click. Pages Visited - Filter sessions of visitors to a specific page - e.g. your pricing page - or a page group - e.g. all your blog pages. Number of Sessions - Look at the visitors who had a specific number of sessions, e.g. returning visitors with more than 4 sessions. Session Length - Search for long or short sessions to track their patterns. Referrer - Filter by visitors coming from specific referrers, such as everybody coming from Facebook. Country - View journeys of visitors from a specific country to reveal different behavior. Platform - Select the visitors coming from a specific platform, such as the ones coming from mobile. Note: Click on "Export to CSV" to export selected visitor journeys. This way, you can explore specific visitor segments, answer much more complex queries about them and find patterns in their behavior. Clicking on a visitor in the list will reveal his/her entire history: A list of all the sessions performed as well as the exact path and interactions in each session. Per session, you’ll see each page visited and every button clicked as well as how much time the visitor spent on each page. Figure out why your visitors are signing up, purchasing, or performing desired actions on your site. The ′coffee′ icon represents idle time, where the visitor either left the browser open or switched tabs. Oribi enables you to identify your website visitors by their email address. It will help you track the activity of specific visitors and connect their sessions across devices. The email addresses collected will be displayed in your Visitor Journeys section. It enables you to search for email addresses and look into specific journeys. 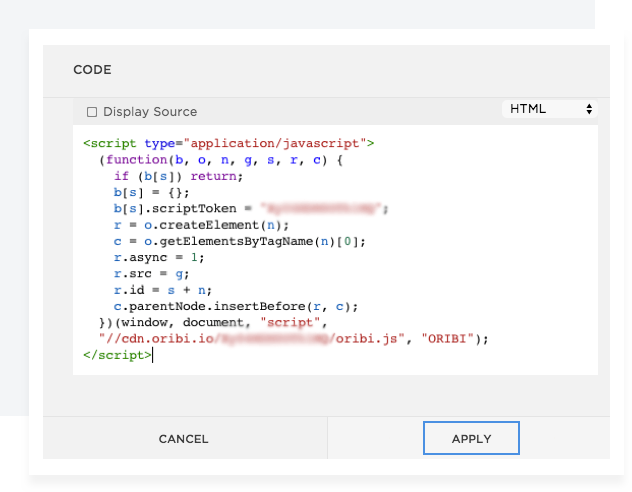 Once Oribi’s script is installed on your site, ask your developer to add the call Oribi.setUserEmail in all relevant pages. Does reading your blog increase the number of sign ups? Are visitors who saw the pricing page more likely to convert? The Event Correlations help you find the answers. Go to the Event Correlation section and select to Create a new Correlation. Define the event you want to understand how it's affecting your conversion. Choose which conversion you're interested in. In the drop-down, your Pinned Events are displayed first, followed by any button click or page visit Oribi tracked on your site. Click Name Your Query to give your correlation a name. In the last step, you can customize the default text of your correlation. Once saved, you'll find your new correlation in the Correlations section. To optimize your results, you need to understand the entire conversions funnel, how many visitors convert and where they come from. Each tool measures your conversions differently, which results in discrepancies. Use Oribi as your ″source of truth″ for an accurate count of visitors and conversions by channels. Collecting counts from different platforms is a challenge for any tool. This is why numbers from Facebook, Google Analytics, AdWords, Bing and other platforms almost never correspond. One way is to sample your data. This means, only a subset of your data is selected and analyzed to give you faster results. But this method usually results in less accurate insights and cannot assure you that the chosen subset is representative for your overall visitors. Oribi collects every button click, form submission and page visit happening on your site. Oribi reports the unique count of each action. For example, if the same visitor clicked on ″Subscribe for Updates″ 5 times last week, Oribi will display it as one time. This method is used to provide a clear summary of converting visitors. So, when you see X subscribers this week in your Oribi account, it means X unique visitors. Oribi’s attribution model is first touch. It means the channels, country and platform count is based on the visitor’s first visit to the site (ever or since the Oribi tracking code was installed). For example, if a certain visitor first clicks on your Facebook ad to get to your site, and later returns via Google to sign up, the sign up breakdown shows the conversion as coming from Facebook. Coming soon: Full attribution visualization. In October 2018, Oribi’s attribution feature will be released. This feature visualizes all the touches a visitor has on multiple channels before converting. The attribution feature will help you score the effect of all your channels and see how much each one contributes to your conversion. Do I need to add the tracking code to all pages of my site? Nope, only to the pages you want to track with Oribi. Oribi will track the pages you add your personal tracking code to. If you do not want to track a certain page, simply don't add the code to it. Will Oribi slow down my site? Oribi was designed to ensure that it has a negligible impact on the performance of any page on which it is embedded. Our script is 29kb, which is probably smaller than any image on your site. How does Oribi protect my data? We know how crucial strong data security is and take it extremely seriously at Oribi. That being said: you control which data Oribi tracks. Every insight that Oribi collects will be stored in your personal account and will only be visible to the account members that have been granted access. The data Oribi collects is fully anonymous. We do not save any personal data, such as email addresses or exact locations of your visitors. All data is processed and stored in world-renowned data centers in the United States. My website has changed. Do I need to do anything? No. Just make sure the tracking code is still there. As long as your Oribi tracking code is still added to all the pages you'd like to track, we continue tracking all events and pages automatically for you and add new events as they occur. Can I use Oribi and other analytics tools at the same time? If you want, you can use Oribi together with other analytics tools. Oribi focuses on increasing your conversions. We give you the tools to understand why visitors behave the way they do, analyze patterns for you and give you the insights that are positively affecting your conversions. Is there a limit to the number of events I can capture? Oribi captures every button click or page visit that is happening on the site(s) you have connected. How do I update Oribi to a full account? Awesome to see you join us! Choose "Upgrade" on the top bar in your account to continue using Oribi. When signing up for Oribi, you'll start with a free trial. It gives you access to all features and benefits of the Standard Plan. 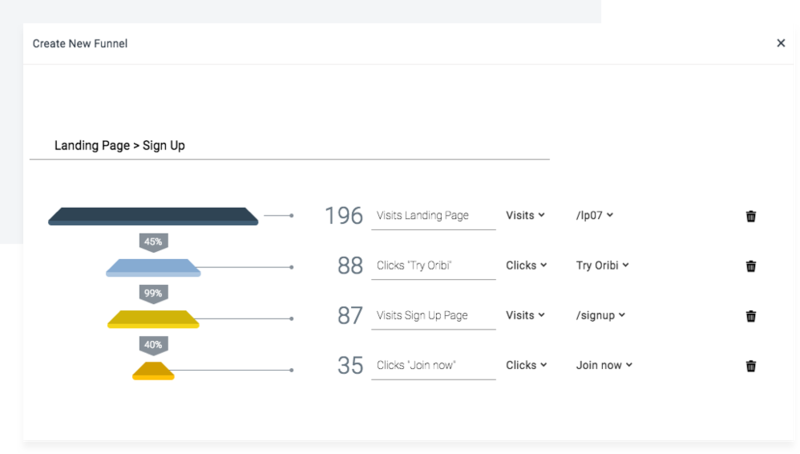 At any time, you can navigate to "Upgrade" in the top bar of your account to continue using Oribi, including all insights for every domain you've connected. Not sure which plan fits best to your needs? Check out our plans or contact us, so we figure it out together. We use an account with several team members. Can I upgrade it for everyone? In this case, we recommend to choose the Standard plan or the Ultimate Plan. You can use several seats with one account - and can also enjoy some more benefits. Which pricing plans do you offer? We offer 3 different plans. Mini - If you're 1 user with 1 domain and up to 1,500 visitors/month, this plan is for you. Standard - Our most common choice. You get up to 5 seats and can track up to 5 different domains with 1 account. There's no limit of traffic or events we can track on your websites with this plan. Ultimate - Mainly chosen by agencies. Use Oribi with up to 10 people, track up to 20 different domains and of course, we handle unlimited traffic and events for you. You track more than 20 domains? Speak to us. Just contact us and we'll navigate you. I need more seats / domains. We know every business has different needs. That's why we offer several plans. If you want to use one account with up to 5 seats and 5 domains, choose our Standard plan. To track up to 20 domains with up to 10 seats, our Ultimate plan is just the right one for you. Need more seats or domains than that? Speak to us. It goes straight to your inbox. We send your invoice per email to the owner of your account. How can I update the invoice settings in my account? You'll find it under "Billing" in your settings. Navigate to Settings > Billing to update your credit card details, change your billing email address or edit the seats in your account. Our aim is to help you understand your website visitors better and take your conversions to the next level. Before you leave us - is there anything we can do to improve Oribi for you? To delete your account, simply contact us. I added the tracking code to my site, but nothing happened. Just go to your website to activate the code. A connection is detected as soon as someone clicks a button or visits a page on your site. If you don't want to wait for your visitors to perform an action, simply visit your website and click something. You site should now be connected. Still not working? Contact us. I cannot find an event in the list. Did this event happen lately? - Oribi tracks events as they happen on your site. If you're not sure that the button click or page visit you want to track was performed in the last 30 days, simply go to your site, perform the specific event. Come back to Oribi to refresh and search for the event again. The event is in an iFrame. - An iFrame embedds content from another website into your site. It's not possible to track events that happen within an iFrame. Need help finding an event? Talk to us. Why do I see different numbers in Oribi than in my other analytics tool? There are different ways to count conversions. This is why numbers from different tools almost never correspond. We chose the way that helps you understand your visitors best. We look at 100% of your data and do not sample. This way, you get fully accurate insights to make smarter decisions. Oribi counts unique visitors converting on your site in order for you to know how many of your site visitors perform a specific event. We attribute conversions based on the First Touch attribution model. This tells you the channel your converting visitors first got in touch with your brand, to help you allocate your resources better. Check the Visitor Journeys to see all channels the same visitor used to get to your site. Which type of data does Oribi track? We only track fully anonymous, aggregated data. Oribi collects and analyzes aggregated data of your site visitors. Any information is fully anonymous and isn't connected to an individual. We do not save any personal data, such as email addresses or exact locations of your visitors. We process and store all data in world-renowned data centers on the Amazon Web Services infrastructure in the United States, which use state-of-the-art multilayer access, alerting, and auditing measures. Our database servers run inside an Amazon Virtual Private Cloud, which is only accessible from the application servers and no outside sources are allowed to connect to the database. Yes. We make sure you can use Oribi with full confidence. The General Data Protection Regulation is a new set of rules to give EU citizens more control over their personal data, which is any information that could be used to identify an individual (such as your name, your email address or your exact location). We value your privacy and the privacy of your website visitors, and we make sure that you can continue serving your EU customers worry-free. Oribi collects only aggregated, fully anonymous data. We do not save any personal data, such as email addresses or exact locations of your visitors. Visitors in the Visitor Journeys are displayed with an automatically assigned number. That being said, no information can be connected to a specific individual. In addition to that, you can also exclude specific IP addresses. In this case, Oribi will not track any action of this visitor at all. We make sure that you can use Oribi with full confidence and continue watching any updates in the GDPR requirements for you. Can I exclude IP addresses from being tracked? You can exclude specific IP addresses or a range of IP addresses. In this case, Oribi will not track any action of this visitor at all. Go to Settings > Account Settings. Under "Exclude IP Addresses" you can indicate an IP address or a range of IP addresses and click "Exclude". Oribi will not track any action from this IP address for any domain you have connected. If you want to track an excluded IP address on your site again, simply choose to delete it from the "Excluded IP Addresses". Once Oribi’s script is installed on your site, ask your developer to add the call Oribi.setUserEmail in all relevant pages. Please note that this function will only take a single argument: the email your visitors provide on your site. The Oribi.setUserEmail method can be called each time a page loads for a visitor you can identify by email, and as many times as needed (i.e. post-login or post-signup page). Oribi will connect the visitor's email to their unique Oribi identifier. When you’re impersonating visitors (e.g., by logging in as a specific visitor through your app’s admin system), we recommend to differentiate impersonated and “real” visitors, either by not setting the impersonated visitor’s email or to by variating the email passed to Oribi.setUserEmail.